Due to its highly affordable $99 price, and tough all aluminum frame, Accurist has long been a top selling reel for Quantum, and now the latest S3 version adds a super easy to use external ACS 3.0 cast control dial that allows for precision adjustments, no matter the lure weight or wind conditions, to promise even greater popularity among anglers. Instead of cheaper, less hardy, graphite frames often used at this $99 price point, anglers will truly appreciate the tough yet lightweight feel of Accurist S3’s all-aluminum frame. Plus, CNC machining of critical mounting locations for gears and bearings keep the gear train in perfect alignment. It also contains an old school flippin switch that’s as rare to find these days as a hand-controlled trolling motor. 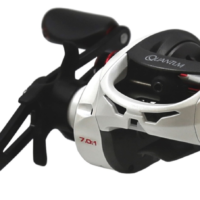 Walleye anglers appreciate it for trolling techniques, and shallow water bass anglers who have loved this feature on Quantum baitcasters over the years will be glad to see its return too. Available in both left and right-handed varieties, with 9 bearings and two popular speeds, 6.3:1 and 7.0:1, at this affordable price, there’s surely a model to satisfy all anglers’ needs, and they are covered by an industry best 3 year warranty. Plus, there are also Accurist S3 combos available that pair these great new reels with several lengths and actions of rods featuring red and white SureGrip™ handles for a combo price of $149.95.